Thuật ngữ Sprint Backlog trong Scrum/Agile là gì? /PMI-ACP /Scrum /Thuật ngữ Sprint Backlog trong Scrum/Agile là gì? Within the Sprint Backlog all activities required to complete the committed entries from the Scrum Product Backlog are stored. All entries have to be estimated on a person-hour base in order to track progress and remaining efforts. The Sprint Backlog is a living artifact and is updated on a daily base. If a team member starts to work on an activity his name is recorded within the sprint backlog. New activities can be added to the Sprint Backlog during the Sprint. At the end of the day all remaining efforts are updated and this defines how much work is left until the Sprint Goal is reached. The Definition Of Done (see below) is used to decide if an item is done or not. The Sprint Backlog can be kept electronically within e.g. an Excel-Sheet or with cards on a task board. The latter has some advantages (e.g. transparency and easy access) but add additional complexity if the Scrum Team is distributed over multiple sites. 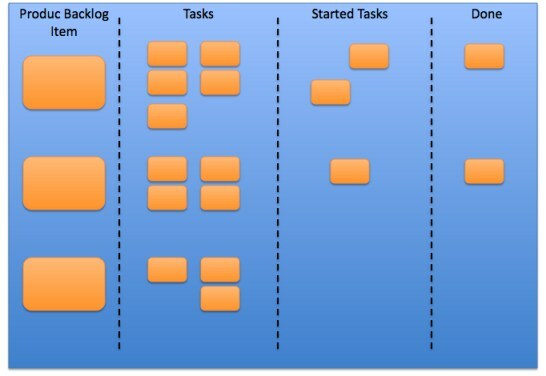 The figure below shows an example how such a task board could be organized. The structure should be adapted to reflect the needs of the project.